Here is one Pizza Mini Loaf. Anyone that loves pizza will enjoy this flavorful recipe for my Pizza Mini-Loaves because these meat mounds conjure up thoughts of a crustless pizza! You’ll make three mini-loaves from ground turkey (or if you prefer ground beef) and stuff them with any leftover mashed potatoes you may have in the refrigerator. 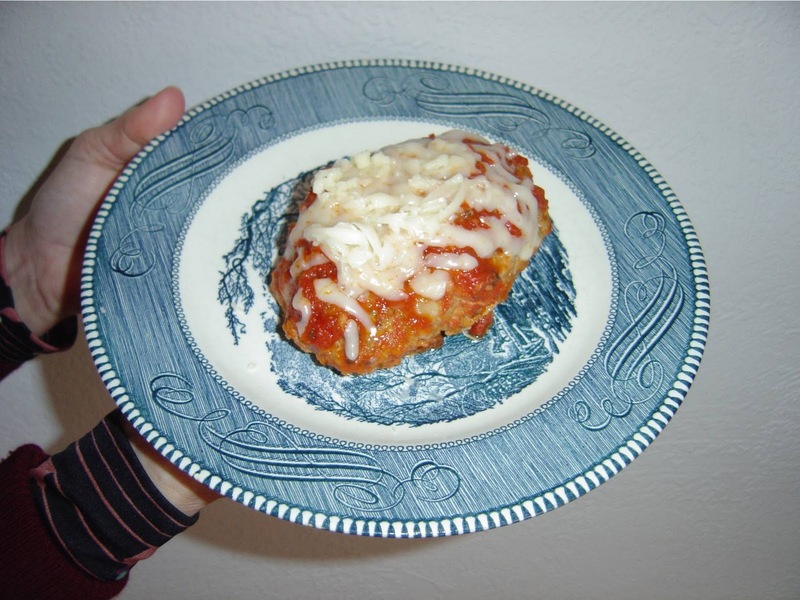 Making my Pizza Mini-Loaves recipe is an excellent way to get rid of those leftovers and the family won’t even know they’re inside the yummy sauced loaves topped with shredded Mozarella cheese. Out of one pound of ground turkey or beef, I like to form three Pizza Mini-Loaves. This amount and the size I use makes it easier to stuff. If these are too big for your little ones, I suggest just cut slices! You’ll like the Dei Fratelli pasta sauce because it’s thicker than others and has about four times more fiber! The only fault I find with the sauce is I like it to be slightly sweeter. My Pizza Mini-Loaves will satisfy that urge for pizza. Brown 1/4 cup of chopped onion and garlic in the oil until golden brown.In your mixing bowl, add themeat, the other 1/4 cup of chopped onion, oatmeal, sage and salt. Form into three big balls that you pat down enough to put 1/4 cup of the mashed potatoes inside. Roll up and repeat the same way for the other two balls. Take your finished meat rolls and add to your browned onions and garlic. Brown them on both sides before adding the Dei Fratelli Tomato and Basil Pasta Sauce plus a teaspoon of sugar. Cook on the stovetop for about an hour. Near the end of the hour, add 1/4 of shredded Mozarella cheese to each mini-loaf. Let melt on top and then serve. You’ll watch how quickly a Pizza Mini-Loaf will disappear once you serve my recipe. Next Post Want An Effective Homemade Dry Skin Facial Mask?